Yo, this James Wright on the Lead Capes Express, talking to anyone who's listening on this dark and stormy night. 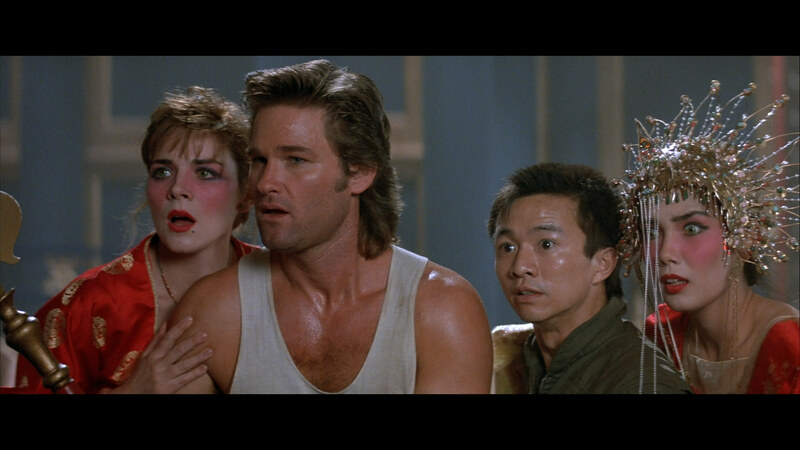 It's a pretty darn amazing planet we're living on here and you have to be crazy or a communist to think that Big Trouble In Little China was anything short of a masterpiece. As I told my last wife, I never paint faster than I can see, and other than that, it's all in the reflexes. So let me tell you about David Lo Pan and his quest to please an ancient daemon, he started out as a basket case on wheels and he ended up an eight feet tall maniac; like nothing you can understand... Mister Burton. I love this film, but who wouldn't? John Carpenter does Wuxia, with a big Western vibe and Kurt Russel channeling the Duke to a comedic extent, great action and classic practical effects that still look great. Lo Pan would make a great villain for any Magic or Martial Arts hero and the whole adventure would translate well to a street-level hero campaign like Gotham City or Heroes for Hire. On the other hand, crank up Lo Pan and the three Storms and have Doctor Strange and John Constantine battle up a Pagoda to face off in a battle of mystic might! If you're one of the few wargamers/roleplayers who hasn't enjoyed Big Trouble In Little China yet, check it out. The Carpenter/Russel team is always worth a look and it's one of the few American films that manage to get Chinese cultural tropes more or less right and the representations of Race are pretty tasteful. Rocket Racoon (Bombshell), Prince Vultan (Dirk Garrison), Blade (Footsore) and Hit-Girl (USX). Miss Marvel (Clix), Slowbro (toy) and Bateu (Hasslefree). 20 Streetlamps from C&C. If I never have to assemble one of these again, I'll die happy. The TARDIS got a new coat of paint, like the real one, it was getting a bit worn and chipped. The Phantom (Avolka), Devil and Nidoking get some flock and Zatana (Clix). It's been a bit of a marathon and I'm glad that the minis are all ready. Now just to finish eight more character sheets and at least ten more terrain pieces. In six weeks. Wish me luck. I've always enjoyed Laurence Leung's comedy, so I was pretty keen to check out his new show on ABC2 this year. Drawing on Wuxia, Blacksploitation and even the classic Adam West Batman TV programme, Maximum Choppage tells the story of a reluctant vigilante protecting a Sydney suburb from the machinations of the corrupt mayor. Simon Chan returns from his studies, welcomed as a great warrior, his friends and family thinking he was at Martial Arts School; in reality, Simon was at the Marshall Art School, focusing on gouache. Simon's dad was a great warrior, a defender of the people until his death battling 100 ninjas, and Simon is expected to follow in his footsteps and defeat the local gangs terrorising the shop owners. Maximum Choppage is a comedy about race relations and family expectations more so than a Superhero adventure, but Simon's struggle to keep peace and negotiate his way out of fights does have the ring of a street-level vigilante preferring to defuse a situation rather than start by cracking heads.The villains Chan faces are no more grandiose than local gangs propped up the corrupt Mayor, but the colour they're given in their loves of Kylie or fish-fighting make for a good laugh. Maximum Choppage draws heavily on the Australian racial comedy that has come before it like Akropolis Now and Fear of a Brown Planet, which typically does not translate well into overseas markets, so it'll be interesting to see if it gains a following outside of Australia. If you're looking for inspiration for 7TV or Fistful of Kung Fu games, it's worth checking out. Yeah, Facebook link sorry, but the file is to big to upload here and it would get banned on youtube in about a second flat. Tell the wife you're taking a trip to Melbourne in may. Been working on the footpath sections for the table extension, but the high density foam was a bit warped. Grabbed some books to even it out, figured I may as well us appropriate reference material. The DVD case is Iron Man 2. I'm re-watching the Marvel films to prepare for Age of Ultron next week. I have my tickets, do you? Had the good pleasure to enjoy my first real game of SuperSystem 4th Edition yesterday; running a new player through the game and testing out the characters I had written up. For those in the know, I wasn't too happy with how a 75BP character looked on paper, so I've made mine 85BP, I find the extra 10BP enables a slightly more rounded character without upping the power level too much. Slufest was the scenario, with three supers a side, testing out some of my new urban terrain. The monorail station dominates the board, hopefully it'll look better with taller buildings on the table. Colonel Quantum, The Anachronisim and Wildcat are ready for action. Equalisers played by me. Sink, Tinker and Destroyer. Blackwing played by Mikey. Heroes and Villains advance to begin. Sink shuts down Colonel Quantum's powers, sending him plummeting to the ground. The Anachronism charges in to avenge his comrade. Destroyer takes advantage of Colonel Quantum's powerless state to kick him to KO. Wildcat leaps in to aid Colonel Quantum, striking Destroyer across the face with his boot. Tinker spawns some Gun Bugs to swing the odds further in Blackwing's favour. The Gun Bugs get stuck in, but can't drag down The Awesome Anachronism! The Cursader's sword makes short work of Sink, freeing up the good Colonel. Colonel Quantum teleports over to Tinker, ripping out some vital component. Swarmed with Gun Bugs, The Anachronism's regeneration proves insufficient. Wildcat leaps to safety when Colonel Quantum's luck runs out and he fails a Resolve Test, falling unconscious. Wildcat's shots go wide of the swarming Gun Bugs. A quick retreat to a nearby rooftop seems to be the best option. Blackwing start to chase after Wildcat, but the game has ended. Blackwing wins! I have to say that I'm liking the 4th Edition SuperSystem rules, powers like Dispel, Gadget Pool and Alternate Form work a lot better and the seven Attributes prevent Super Strong characters from dominating. Blackwing work great, I'll add Hammer and Anvil and they should round the team out nicely. The Equalisers are in desperate need of some ranged support and a team leader, so Mindstorm and The Machiavellian should be seeing the light of day soon. Most importantly, I need to get some more people interested in starting up teams. I was fortunate enough to pick up a couple of Dragonball Z seasons that I was missing at Dixon's Recycled a couple of weeks back; Seasons 5 and 6, basically giving me the entire Cell story arch. Season 5 covers the Imperfect Cell and Perfect Cell Sagas; I never remembered the Cell stuff fondly, probably because the Trunks and Android Sagas are among my personal favorites. I found it a pleasant surprise then, when I really enjoyed the Imperfect Cell Saga this time around. 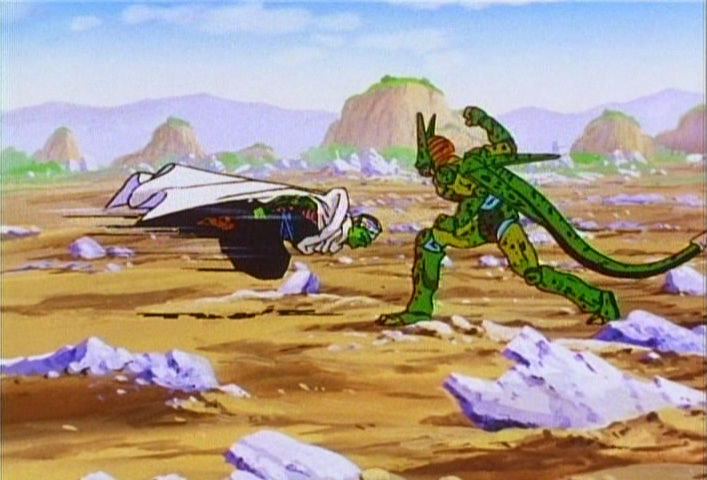 The action focuses on Piccolo, Tien, Yamcha and Krillen as they chase after the elusive Cell, who they can't hope to defeat, trying to prevent him from killing too many innocent people or getting close to the Androids.The reveal of Cell is actually really well handled; in a deserted city, Piccolo can sense a great evil as is looking for it and there's no sound, absolute silence. As cell gets closer, breathing can be heard, then footsteps. A pretty awesome and subtle moment for an action-based show. Another scene of note involves an airport and a couple of siblings running for the last areoplane as Cell chases them, bent on absorbing their energy into himself. Krillen is the only hero on had to save the children, and he leaps into the fray, knowing full well that he is no match for Cell. It's a great moment of a hero being defined by their actions rather than their powers and, again, pretty rare for Dragonball Z. Krillen actually has plenty of good moments in the Imperfect Cell Saga, really getting some hard choices to make and having to live with the consequences of his decisions. It's probably the best use of Krillen since Dragonball and pretty rewarding character development for longtime fans. The Imperfect Cell Saga is, itself, imperfect. Lengthy ego-clashes between Cell and Vegeta are dull and constant references to the Saiyans being the Earth's only hope grate after a while. That said, the Saga isn't terribly long and has a lot of great moments to check out. The scenes in the deserted city and at the airport are great inspiration and I can see myself using them for scenarios before too long.